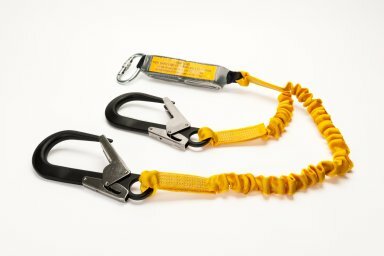 Accredited to EN354 and EN355 our Twin Leg Lanyard is made from 35mm tubular webbing, tear webbing and 25Kn backing webbing. Weighing only 5KG with a 6KN max arrest force it gives the user a safe way to remain anchored onto a structure at all times through its one of which is 1.0m in length for use when on a scaffolders step, the other is 1.85 for normal use. Comes with a single built in shock absorber.